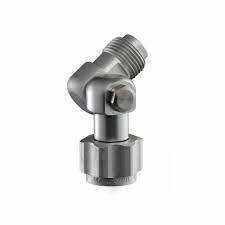 Attach to a tip extension or pole extension or direct to your spray gun to spray at a variety of angles with this high quality TriTech swivel connector. 260 degrees of rotation allows you to quickly and safely adapt to nearly any spray application. Supplied in a 7/8" thread that is compatible with 90% of spray guns including Graco, Titan, TriTech, Wagner & Q-Tech. If you know you require a 11/18" thread please contact us as these are rarely required and are a special order.